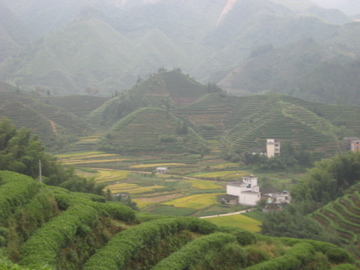 For my next 2010 field visit (following Julie’s family in Jiangsu province), I contacted a family that was running a large-scale tea farm; at least, definitely larger than the standard ‘noodle plots’ that rural families are allocated through the village collective (although the size of the plots depends on the demographics in each village). The family included a husband and wife, two girls, and the husband’s mother and father. 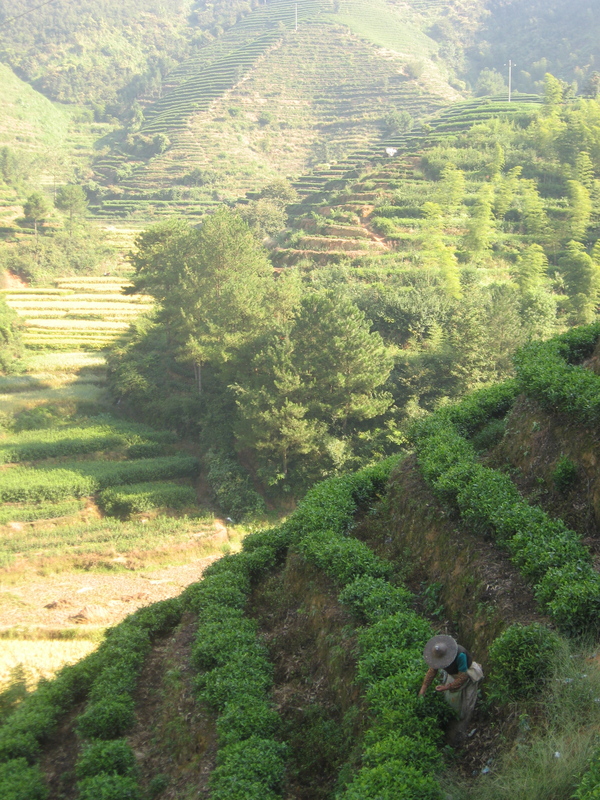 During the peak harvest season from April to June the family would employ up to 50 tea pickers (all women) who migrated from more isolated villages in the county to work on the farm and live at their house (it is more like a compound with 15 extra rooms for the workers). At the time of my visit the harvest season was winding down, and there were about ten women still living with the family and working in the fields. This was the only family I visited that actually employed other workers on their farm. The first time I visited this family, they told me farming was their main source of income and they believed it was a sustainable form of livelihood, but they also felt their lives had improved little from the past and they still did not have enough money. 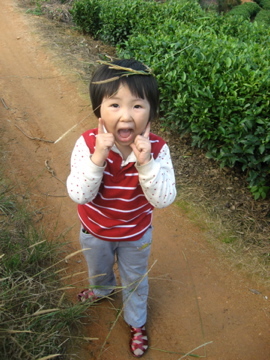 When I returned to visit a month later the husband and wife were running a hotel/restaurant while the husband’s father and mother were running the tea farm and looking after the kids. 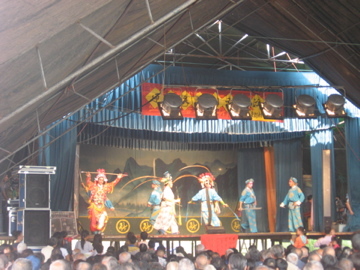 This was significant because the land policy I was researching was encouraging farmers to choose between either becoming large-scale, full-time farmers by acquiring the land of other farmers in their village, or, if they did not want to farm full-time, to transfer their land to other farmers in their village and pursue full-time work in nearby towns or cities. 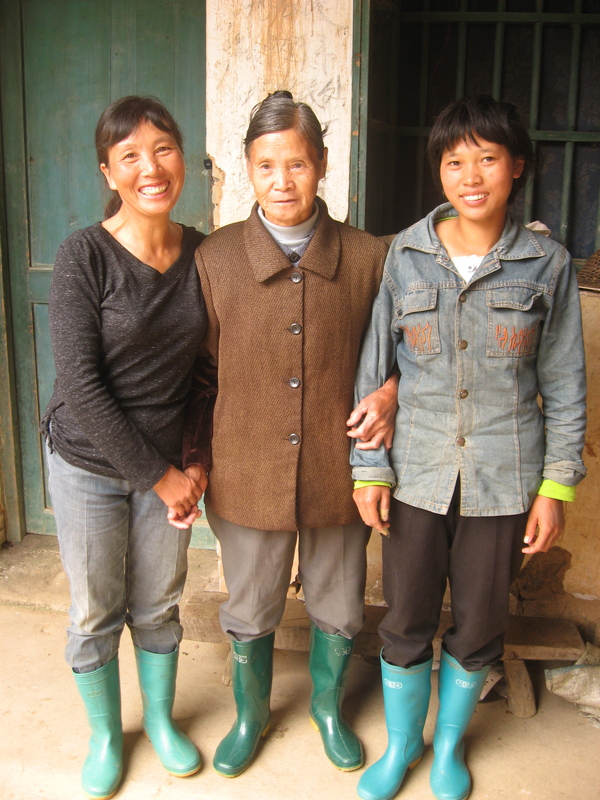 However, this family was capable of managing a secondary occupation during the off-season in addition to running their tea farm (I happened to visit their restaurant on the opening weekend when there was a tourist delegation of more than 100 visitors). The father’s mother, still processing tea late at night. 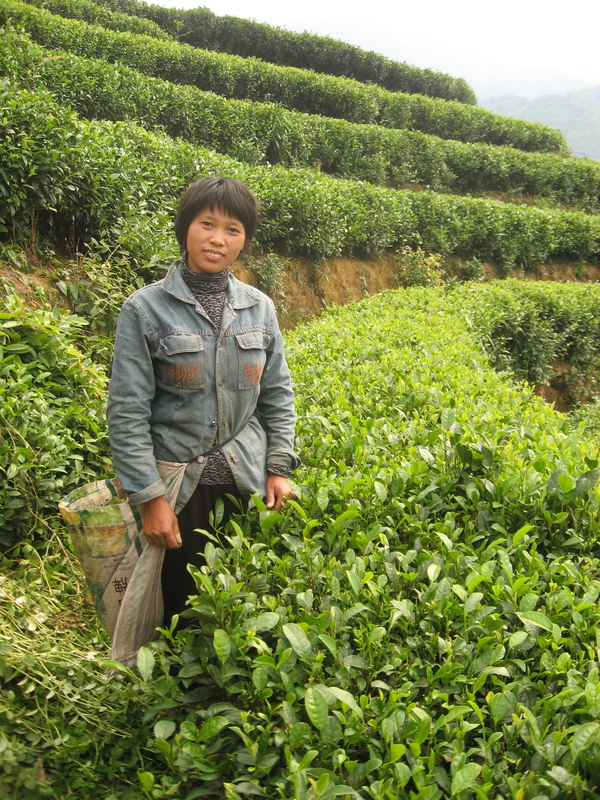 The mother explained to me that while they are very busy during the tea harvest season – every day is the same and they must work from early morning until late at night (a few nights they were still processing tea past 9pm)—in the off-season they are not busy and she rarely had work to do. That’s the tea roaster on the left. On the right are the leaves laid out to be cycled through. 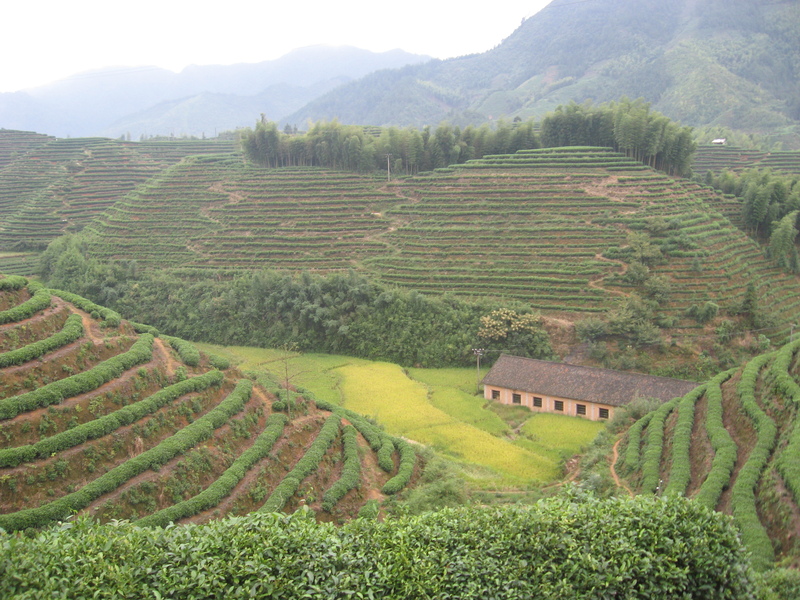 During my first visit, I tried to alternate back and forth between picking tea with the women in the fields (the mother-in-law also picked in the fields), and joining the mother and father in the barn at the base of the tea fields where the tea was processed. This mainly consisted of a large cylindrical burner where the leaves were roasted, and when they were reluctant to put me to work, I assigned myself the task of gathering the leaves when they shot out the back end of the burner and then stuffing them back in the front end as they needed to cycle through at least a dozen times before they were fully roasted. It was while working with the mother in the barn that I learned the women work each day from 5:30am to 11:30am and then return to the fields again from 2pm to 6pm. 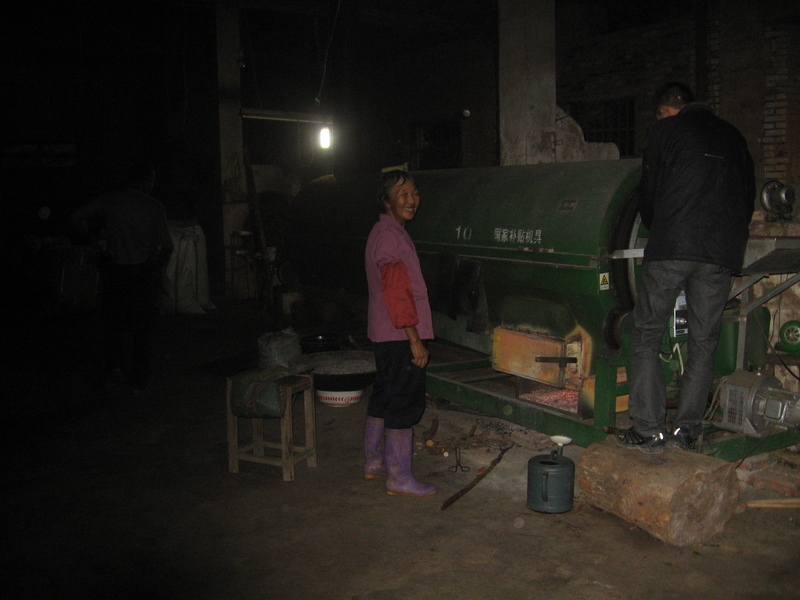 They can earn around 100 Yuan per day (about $12 dollars at the time), based on how much the pick: before lunch and again at the end of each day the workers bring their baskets down to the barn where their leaves are weighed and the weight recorded before being tossed into the roaster. 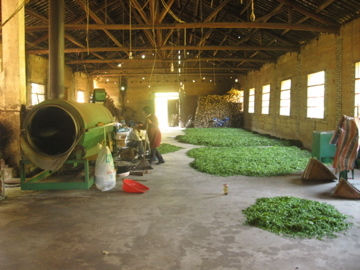 After roasting, the family brings the processed leaves to a buyer in a nearby town who acts somewhat like a middle-man, buying their yield in bulk and sending it on to be sold for retail. 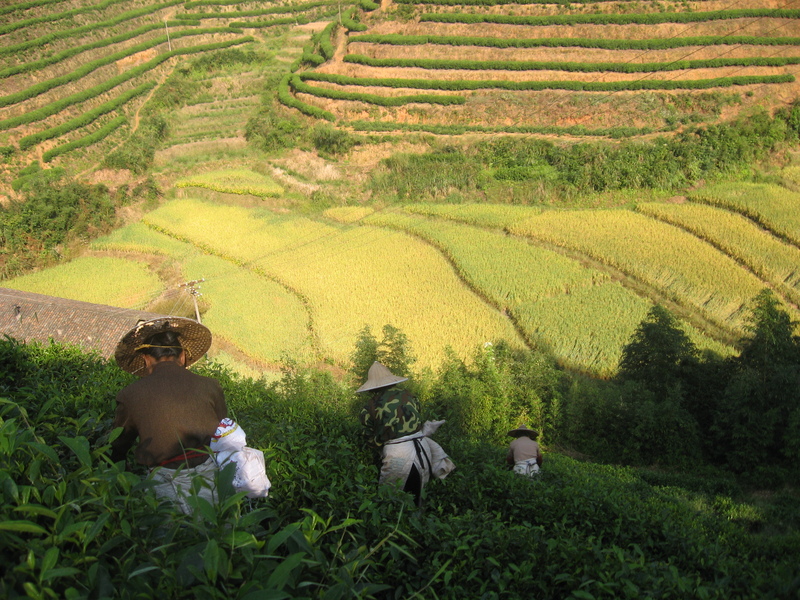 When joining the women in the tea fields I learned that many of them were getting ready to return to their villages as the harvest season was winding down; they had been living and working on the farm for three to four weeks. 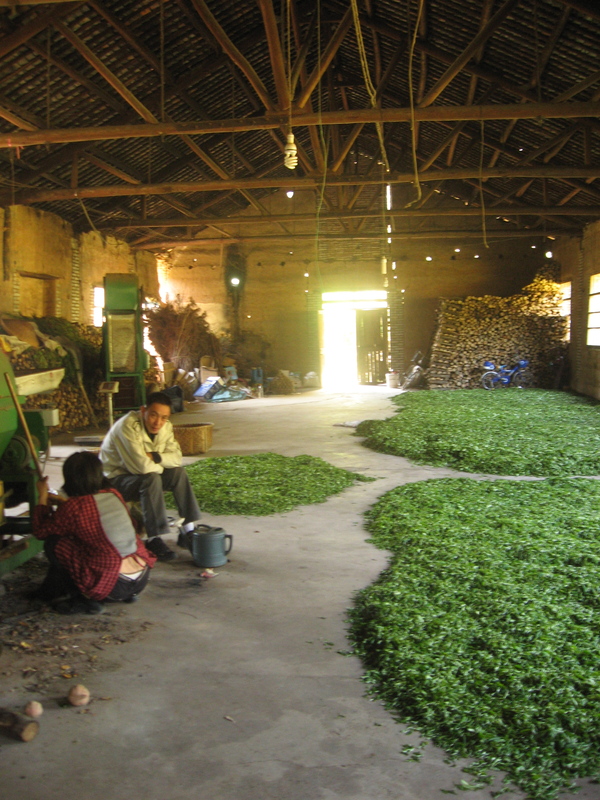 One of the women I spoke with told me that during the off-season when she is not picking tea she works in a factory making clothing (her husband raises pigs); she said working in the factory was very difficult, more difficult than picking tea. But there was one night I remember vividly – it was the night before the last few women who had worked as tea pickers were planning to return to their villages, and they invited me to accompany them for a walk down to where the dirt road merges with the paved road into town, and a small stand sells various snacks and drinks. The moon was bright enough that we didn’t take a flashlight, but the path was uneven as we walked, and one of the women linked her arm with mine. 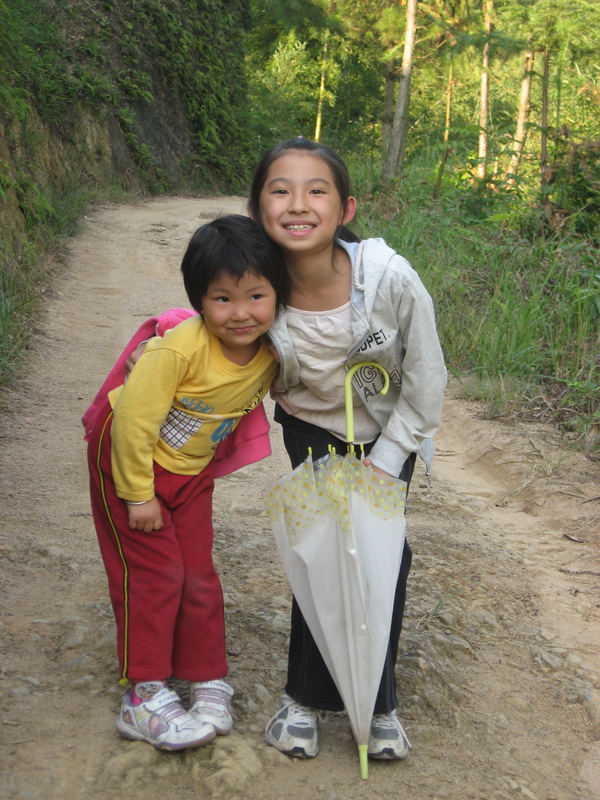 I listened quietly as they chatted about their plans for returning to their villages, and for a fleeting moment I felt as though I had crossed a threshold where everything that separated us seemed to fade, and we were just going for a walk to the store. The second time I went back, I brought my cousin Leah, who happened to be visiting me at the time (she lives in New Zealand). 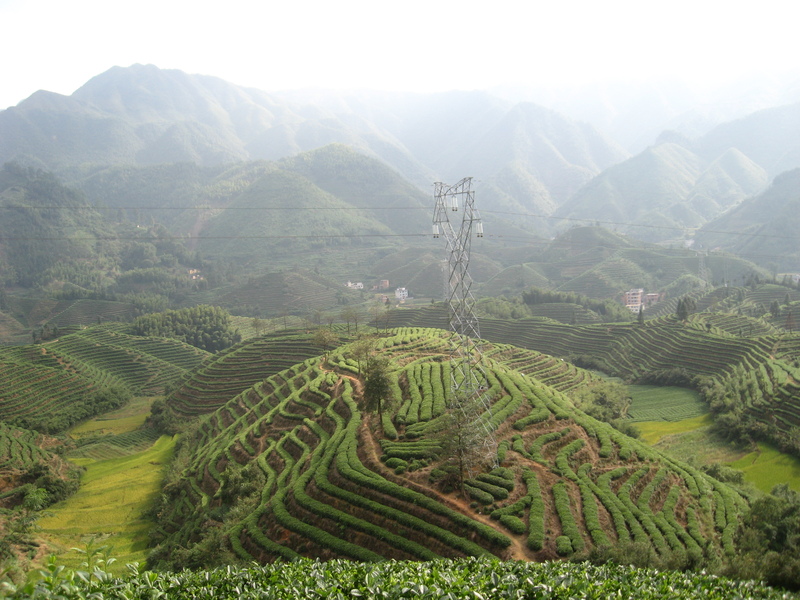 Rather than returning to the tea farm, when we met the mother and father at the bus stop in Suichang, we piled into another small bus and they took us to another town about 30 minutes away where they had recently started their hotel/restaurant business. Hotels/restaurants like theirs were shooting up around the hot springs in the area to accommodate the growing tourism industry. When we arrived, it looked like they were preparing for the opening day, and it turned out that was exactly what they were doing. The mother told me that they were anticipating a “delegation” (I don’t know whether she meant an official delegation or just a large group) of more than one hundred people. Leah and I set to work helping to arrange tables and chairs, and before we knew it a reporter and cameraman from the local news station arrived and appeared very excited to find two foreigners working in the restaurant (I found out later someone had called asking them to do a story on the two foreigners working on the day of their big opening). At first the two reporters were inconspicuous, but pretty soon they were just following Leah and I around. It was kind of funny at first, but then, when the guests arrived and we set to work waiting tables, our task became increasingly complicated as the guests began offering us their seats and their food while we hurried from table to table with the cameramen in closer pursuit. Most of the weekend is a blur of arranging tables, setting tables, waiting tables, praying I didn’t spill anything on myself or anyone else, and using any free time to entertain the young kids with any game Leah and I could dream up (we got pretty creative by the end) in order to avoid the reporters and having to take any more pictures with the older guests. On Sunday when the father pulled up in front of the restaurant with his pickup to take us back to the bus station, Leah and I, sensing freedom from the cameraman was near, made a mad dash for our bags and rushed out the door, only to see the reporters on our heels asking if they could hitch a ride back to the bus station too. I assured Leah (and myself) that it would only be another 40 minutes til freedom, but when we got to the bus station I became stricken with panic when I couldn’t find our bus tickets, and not only was my panic caught on camera as I emptied the contents of my backpack on the bus station floor in a desperate attempt to locate them, but it was increasingly heightened by the thought that we might be stuck with the reporters for the next three hours. Minutes before our bus was scheduled to depart, I found the tickets in the inside pocket of my jacket, and we made a mad dash for the doors while I held the contents of my backpack in my arms, not wanting to take the time to stuff everything back in. Apparently, we were scheduled to air on the local news station the next evening. Now that I’ve had some space to reflect on the absurdity of what the cameraman must have recorded, I would give anything for the narration that accompanied our news story. 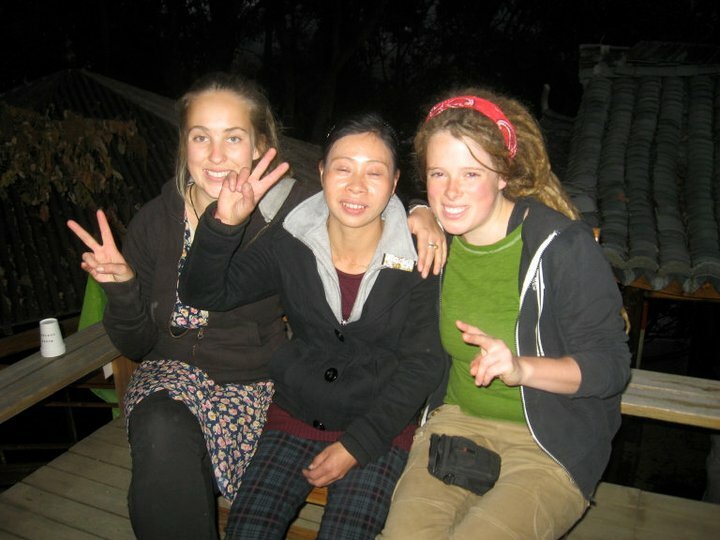 This entry was posted in 2010 Rural Field Visits, Zhejiang Province and tagged rural China, rural land-use, Suichang, tea farming, wwoof china, Zhejiang. Bookmark the permalink.